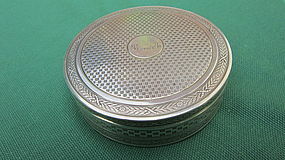 An Emil Puirforcat French first standard (.950) silver round box with a gold washed interior. The surface of the exterior covered with engine turning and engraved wreaths punctuated with blossoms. 3 3/8 inches (8.5 cm) diameter and 1 inch (2.5 cm) tall. Weight approx. 154 grams. 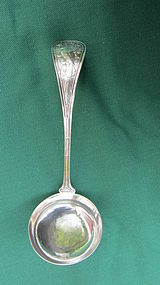 A late 19th or early 20th century sterling silver sauce ladle with a round bowl, marked on the back of the handle, “STERLING, J.E. CALDWELL & (the rest of the punch missing) PATENT.” The front of the handle decorated with a long tailed bird (Jay?) in foliage. On the back is more foliage, the marks, and the engraved initial “F.” Approx. 7 inches long. Approx. 60 grams. Condition: Some wear. Decoration still crisp. J.E. Caldwell were a major Philadelphia maker and retailer.